Up until today, I have waxed all of my hard cheeses. Actually, no. I didn't have to do anything to my smoked gouda, since the smoke residue is noxious to most bacteria and made a suitable rind in of itself. But that all changed tonight! Tonight I began to bind my cheeses in cloth. Wax is great for helping to control moisture in a cheese. 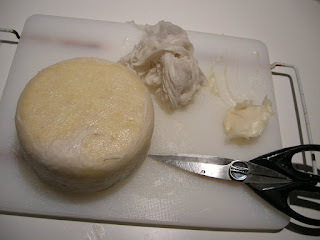 If you don't want a cheese to loose any more moisture, but still want it to develop more flavor, waxing is the way to go. The airtight seal keeps moisture in, while the cheese continues its magical aging odyssey. Cloth, naturally, isn't gas-tight, so you still have oxygen exchange with the outside environment. But it does help restrict the loss of moisture, along with becoming an instant rind. As time goes on, the rind will gather various molds on it, but they'll soon die off and rarely ever penetrate the cheese. But they do add an earthy flavor. 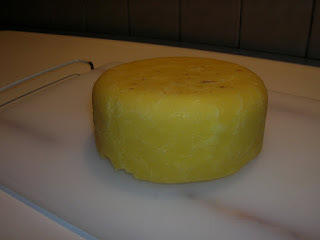 I made my first cheddar about a month ago, which turned out fine. With the basic cheese recipe down, I decided to start practicing my wrapping. I cut out two circles of cheese cloth, along with a strip for wrapping around the waist of the cheese. Then I got out my lard. Lard? Yes. The bandage needs a bit of glue to stick, so lard or butter is traditional for cloth- binding. Although the Spanish also mix globs of lard with herbs and smear them over cheeses to mature and impregnate an herbal flavor. Butter worried me, since it has a higher water content and might be prone to spoilage. Plus I had a big jar of lard in the fridge. After boiling the cloth cut-outs to sterilize them, I fit them around the wheel and worked the fat into the cloth to adhere. 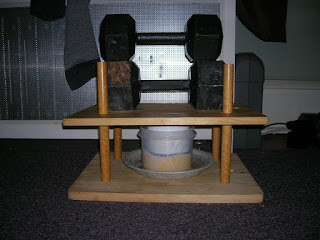 Then the newly bandaged wheel was pressed for 24 hours at 55 lbs of pressure to really bind the two together. Hopefully, with more experience under my belt, I will one day be able to create a cheddar as delicious as the King Island Dairy Black Label Cloth Bound Cheddar. Now THAT's a mighty fine cheese. A cheese, that sadly no one seems to import now, despite the fact that the dairy's Roaring 40's blue cheese is a staple of any grocery store with a decent cheese selection. Well, a dude's gotta have goals. P.S. 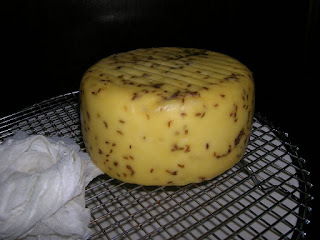 I also made a wheel of Leyden, which is like gouda infused with a smoky influx of cumin seeds. Just FYI. Sorry for the delay in my reply. You shouldn't need to add more fat to the rind, unless you notice it's cracking as the fat and wheel begins to dry. It's more of a brushing than a rub or smear. You just press down any fluffy molds to spread them around the rind and to get an even coating on the wheel. Most Leyden in the US is from reduced fat milk, so I used a full-fat Gouda recipe and added cumin seeds to get the texture I wanted. Good luck with your wheels!